We have a special treat today for our Camino Podcast listeners. Alot of you will be familiar with the short, punchy podcasts that accompany our blog posts. Well our latest addition is a little different. 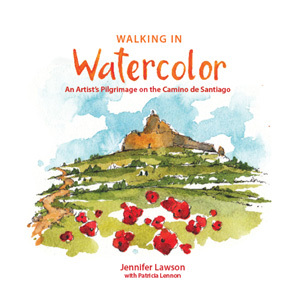 When Jennifer Lawson and Patricia Lennon got in touch about their new book ‘Walking in Watercolor: An Artist’s Pilgrimage on the Camino de Santiago’, we were intrigued. Then the book arrived, and we got excited! 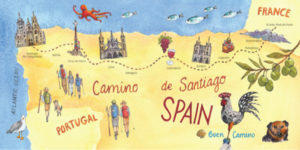 Jennifer has travelled the world with her art and decided that the Camino would be the perfect destination for a project that includes over 200 original watercolor paintings. The brilliant imagery is accompanied by diary style entries that perfectly capture Jennifer’s journey on the ancient trail. We enjoyed the book so much that we arranged a call with Jennifer for a brand new longform podcast. We discussed her leaving her job to travel and her decision to pursue her passion. We also talked eating Pulpo on the trail, making new friends and how the journey impacted her mentally and physically. ‘Walking in Watercolor: An Artist’s Pilgrimage on the Camino de Santiago’ is available worldwide on Amazon. If you’d like to learn more about Jennifer or her work you visit her website! We are looking for feedback on our podcasts, so if you have any suggestions on who we should talk to or topics you’d like us to cover just comment below!